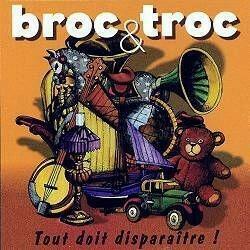 Broc & Troc is a card game. The game contains 45 cards, all different, each containing 3 of 9 objects. Spread 36 cards, face up, into a 6x6 square, and discard the last 9. Each player takes one card in turn from the available cards, and places it face up in front of him. When all the cards have been taken, the majorities are counted. For each of the 9 possible objects, the player who has the majority scores as many points as he has copies. The other players don't score anything. In the event of a tie on the majority, no one scores. The player with the highest total points is declared the overall winner.